Bad breath is an unfortunate issue for millions of Americans. While everyone suffers from the occasional bad breath, many people find themselves with the persistent issue. Lifestyle changes are often all that are needed to combat this stinky problem, many of which are addressed below. Quit tobacco. If you use any sort of tobacco, it is time to make the decision to quit – for good. Tobacco has many negative health side effects that have long-reaching and deadly results. Along with the strong odor that tobacco has on its own, the damage that it does to your mouth only intensifies its smell. Tobacco has no health benefits, and it is time to make the choice to stop using it. Stay hydrated. Water is the most widely beneficial substance to the human body, other than oxygen. The body depends on adequate amounts of water in order for it to function properly. Your breath is directly related to this because how hydrated you are will affect the scent of your breath. Saliva production is necessary to keep the mouth clean by constantly washing away plaque buildup. The more water you drink, the less plaque will be able to build up on the teeth, and the better your breath will smell. Avoid odorous foods and beverages. Some foods and beverages are just notorious for leaving behind a stinky smell. Coffee, alcohol, wine, garlic, onions, and cheeses are among the most well-known culprits. All of these foods and beverages have their own strong odors, thus, after eating them they leave a residue inside your mouth which causes the odors to linger for hours. Avoiding them is the only guaranteed method to ensure that they do not affect your breath, but this is not always possible or even desired. It is always a good idea to keep a toothbrush, tooth paste, and mouthwash readily available to you so that after you indulge in a meal, you can easily help to combat the odors that are left behind. Practice good oral hygiene. Brushing your teeth at least twice a day and flossing your teeth daily are essential parts of your oral hygiene routine. Brushing and flossing help to remove bacteria-laden plaque from the teeth and gum line. Plaque is the main cause of cavities, tooth decay, infection, and disease – all of which contribute to bad breath. By practicing good oral hygiene, you are preventing bad breath at its source. Clean oral appliances. Oral appliances are common culprits of bad breath simply because wearers forget to clean them thoroughly. Plaque builds up on appliances just like it does on teeth. Any type of oral appliances should be cleaned before placing it into your mouth. 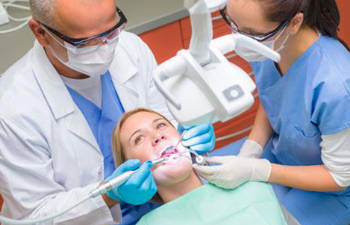 Visit your dentist regularly.Visiting the dentist regularly is essential to caring for your oral health, as well as dealing with bad breath. Your dentist provides professional cleanings and thorough exams in order to help you achieve and maintain optimal oral health. If the above mentioned changes do not improve your bad breath, something more serious could be going on. Your dentist is your best source for figuring it out.